" ... Speculations about a possible CIA role at the 'privately operated' Radios began circulating publicly almost as soon as the stations began. Although it took nearly two decades, the rumors were eventually confirmed when RFE was identified by the New York Times in 1967 as being CIA-sponsored. The unmasking of RFE and RL is significant partly because it took so long, but more so because the press and broadcast media were, in many cases, well aware of the connection between the CIA and the stations and simply chose not to report the link. ... "
The history of Radio Free Europe (RFE) and Radio Liberty (RL) is the stuff from which good spy stories are written. During the first two decades of their existence, the cloak-anddagger drama common in fiction was reality for the Radios. Poisonings, espionage, bombings, sabotage, murders, and a few unexplained employee deaths were some of the hot signs that the Radios were deeply involved in the Cold War.1 Authors who have written about the stations-almost exclusively insiders-have understandably chosen to include such occurrences in their narratives. But these events hardly tell the full story behind America's two Cold War propaganda stations. A comprehensive account of the Radios' past has yet to be published When and if such a work appears, it will not be complete without a full recounting of how the established news media covered up information that RFE and RL were CIA conduits. Historical evidence presented in this article indicates that when it came to covering the stations, the media, often knowingly, propagated illusions, not truth; manipulated public opinion, rather than informed it; and tried to manufacture consent, instead of promoting democratic processes through full and open reporting. Although events described here took place during the Cold War, there is reason to think that today's news media continue to be silent about government activities at America's propaganda stations. Beyond remaining silent, many journalists and news media members also knew about and supported a charade that CIA and Radio officials concocted to hide the agency's connections to the stations. The charade, a propaganda campaign called the Crusade for Freedom, successfully persuaded thousands of Americans to donate millions of dollars to the Radios, never telling them that the Radios were already completely funded. The Crusade, in effect, was a cover, making the Radios appear to be supported only through voluntary donations. The men in charge of the Radios and the Crusade were avid propaganda enthusiasts. They believed that propaganda, in combination with other aspects of statecraft, was powerful enough to persuade entire populations that the American way was the right and only true way. In the first few years after RFE began operating, they fully expected communism to fail quickly, in part because of their efforts.6 They were not alone in this thinking. They were supported and aided by journalists. The New York Times published one of the most blatant appeals for public support of the Crusade. Its front-page story described how the president urged all Americans to "intensify the will for freedom" in countries behind the Iron Curtain by supporting Crusade efforts. He said that RFE had well demonstrated its "hard-hitting effectiveness" in winning men's minds, and indicated that organizers hoped to raise ten million dollars to operate RFE. 16 "Without this victory," Eisenhower urged, "we can have no other victories. By your efforts, backed up by America, we can achieve our great goal-that of enabling us and all peoples of the world to enjoy in peace the blessings of freedom." Other than the president's remarks and a few details about fund raising goals, the article contained almost no background about the Crusade itself. Beyond financial and editorial support, established media members showed their willingness to help the Crusade and the Radios in other ways. In many cases, reporters and media executives were on the stations' organizing committees, sat on their boards, and worked in their newsrooms.19 Few eyebrows lifted at the conflict of interest this created. It was only in the late 1970s that news reports and a Senate investigation revealed that a number of journalists had worked directly as agents and as informed conduits for the CIA since the time of the agency's founding.20 While such direct involvement was troubling for some members of the journalistic community, many reporters and media executives wholeheartedly embraced working for the CIA-run Radios and had for many years. Working for an organization funded by the CIA is not the same as actually working for the agency itself, but both should have raised ethical concerns. Of the high-ranking media executives and publishers who occupied positions on the Radios' organizing committees or boards, the two most influential were closely associated with the Time-Life-Fortune empire. The first was its founder, Henry Luce.21 A review of Luce's publishing policies makes his affiliation with RFE's board of directors seem only natural. He was a conservative patriot and fierce anti-Communist. The son of a missionary, he was also a religious man, who closely associated God's plan with America's destiny. Believing that America had a moral obligation to lead the world, Luce was committed to spreading freedom and democracy. After 1946, this commitment included fighting communism and winning the Cold War. In battling communism, Luce may have allowed his politics to overwhelm his better news judgment. He rarely hesitated to use his magazines as forums for expounding his views, eagerly providing space for causes he supported. He lavishly covered the Crusade for Freedom several times in Life, for example. On one occasion in February 1954, an article described a Crusade-sponsored mass balloon launch, which sent 4,000 helium-filled balloons aloft over more than 400 American towns and cities, each carrying cards requesting Truth Dollar donations.22 Crusade for Freedom newsletters duly noted Luce's generous support. As one of five men appointed by the president to reorganize America's propaganda program, Jackson wielded considerable control over propaganda directed at people on both sides of the Iron Curtain. He was fully aware of the CIA's ties to the Radios and recommended that its cover not be destroyed. If not publicly exposed, the Radios could take "positions for which the United States would not desire to accept responsibility. "28 The benefits of secrecy were not lost on Jackson: "We can play tricks, we can denounce, we can take chances, we can act fast, all things that an official government propaganda agency cannot do. "29 Like publishers and media executives, reporters also became associated with the stations. Some sat on the Radios' boards; others joined their staffs. In many cases, they knew about the CIA's connections to the stations and kept silent. The best indication of this comes from the diaries of William Chamberlin Working for the Christian Science Monitor, Chamberlin had been one of the first American correspondents to cover the Soviet Union after the Bolshevik revolution. He remained abroad for seventeen years, but then returned to the United States and began writing editorials for the Wall Street Journal. In the 1950s, he accepted a position as an RL board member. Yet, some evidence suggests that it was. According to Donald Shanor, who studied the stations in 1968, gossip about the CIA's ties to the Radios began as soon as the stations started operations.3 Presumably, journalists were among those who heard the rumors but failed to investigate them. Mickelson contends that journalists often knew the truth but "kept their lips and typewriters sealed. "37 Paper collections and other available sources of information, however, establish little beyond the fact that some journalists outside the stations were familiar with the Radios, knew their board members, and occasionally corresponded with Radio insiders. McCormick's connections to politicians and Radio insiders should have made obtaining information about the stations both possible and relatively easy. Yet, she was not the only journalist with such connections.40 Joseph Alsop, one of the nation's leading columnists in the 1950s, was also well connected and familiar with the stations. He was invited by a Crusade for Freedom staffer in 1952 to describe for "millions of unwilling prisoners of Communist aggression" the truth about life in the United States. Alsop politely declined, claiming that his previous commitments prevented him from accepting the offer.41 On the other hand, why did Alsop not investigate the Crusade or the Radios more closely? 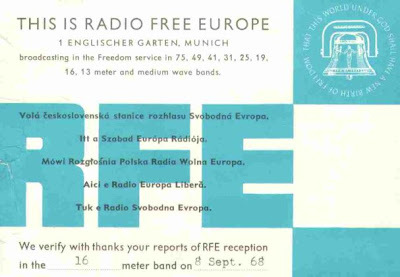 RFE had been broadcasting for three years when Alsop received his invitation. As time passed, journalists like him were apt to become more aware of the stations and, no doubt, the intelligence community's involvement with them. Established media got the kick in the pants they needed to start investigating organizations connected to the CIA after a left-wing, San Francisco-based, alternative publication called Ramparts broke a story linking the agency with the National Student Association (NSA).42 A young Ramparts reporter, Sol Stern, began investigating the NSA after receiving a tip from a college student. In retrospect, Stern said, "The fact that the established press did not break this story shows just how complacent and compliant it was."" Stem said that reporters at Ramparts, unlike those at the New York Times and Washington Post, did not work on the assumption that government would provide information. This difference, he claimed, made Ramparts somewhat of a fringe publication. Stern believed Ramparts would have published more adversarial articles had it had more funding, but even considering the shoestring budget on which it operated, it often printed investigative pieces that were more editorially responsible than those of the mainstream media. Otherwise, Stern wondered, "Why did the large media like the New York Times and the Washington Post with their huge budgets not get this story?"" The only people not in on the secret, it seems, were members of the American public, especially those who contributed unknowingly to the Crusade. It is important to point out, therefore, that all the secrecy created an ironic situation in which CIA and Radio officials participated in the same undemocratic practices that they claimed to be battling abroad. As a small cadre of in-theknow officials, they skirted proper channels to form broadcast stations that operated outside of government's official system. Sub rosa, they avoided potential conflicts by stifling healthy debate, keeping Congress and the public in the dark about the Radios. Had more members of Congress known the truth, they might have limited funding or perhaps even closed down the stations. Mickelson articulated his fear of this, no doubt shared by other insiders, when he expressed a desire to avoid "selfserving interference" from Congress into the Radios' affairs. That the CIA and Radio executives wanted to keep their secret is not surprising. History teaches that those with power, when left unmonitored, often wield it as they see fit, even if it is at the expense of others. It is not a stretch, therefore, to imagine how CIA and Radio officials willingly subverted democratic processes to accomplish their goals. What should be troubling to a society founded as a participatory democracy, however, is that the institution expected to stand between the public and the awesome powers of government failed so completely in its guardianship role. Authors Noam Chomsky and Edward Herman have explained that such reporting failures are often the means by which media elites help manage public opinion or manufacture consent in the service of big business, the government, or the military.53 Creating illusions for public consumption, Chomsky argues, is necessary if those with power are to keep power.' It is not unusual, therefore, to find media elites, all with an interest in maintaining the status quo, willing to publish stories or remain collectively silent. Censorship and regular propaganda campaigns, Chomsky and Herman point out, serve to control the "premises of discourse" and keep the public's view "at serious odds with reality." Chomsky and Herman's concepts of manufactured consent explain the news media's failure to meaningfully cover the Radios or the Crusade for Freedom. The men who sat on the stations' boards were media, business, and government elites interested in maintaining the status quo in the face of a potential threat from communism. They manipulated public perception through the Crusade for Freedom's propaganda campaign. That campaign was not investigated or criticized by journalists before the 1970s because the controlling influence of elites inside the media companies, along with other organizational constraints, stifled reporting contradictory to elite priorities. The result was a collective silence which was totalitarian in nature. Historical examples of CIA-media cooperation like the RFE and RL episode do not provide a blueprint for solving all the questions we have or the conflicts that arise over issues of government-press cooperation. These examples do, however, provide valuable pieces of information and insight. The Radios' experience shows that if journalists are co-opted by government, the full ramifications and consequences of the penalties may not be fully realized for decades. News media members were and remain responsible for their decisions to collaborate with the CIA, just as they are responsible for deciding to withhold information from the public. They decide whether to cross the line and engage in secret government work or to uphold journalistic principles by refusing clandestine government offers. In making such decisions during the Cold War, the news media fell short of being ideal guardians of the public interest. So long as the window remains open to CIA-media links in the future, it will be journalists who hamper or enhance that guardianship role. Not long before the "60 Minutes" program, an additional $7 million was spent relocating TV Marti facilities to Miami. Kroft reported that government officials such as David Burke, the chairman of the federal broadcasting board of governors who oversees TV Marti, should have been notified but were never told. Instead, the relocation was engineered behind the scenes with no opportunity for public discussion. According to Kroft, when Burke found out about the move, he wrote to members of Congress and people in the administration, including Leon Panetta. He requested hearings about the money spent on TV Marti's move and the possibility that hundreds of millions of dollars are wasted every year for its operation. No one in government responded There were no hearings and no further news stories. TV Marti officials, like RFE and RL officials before them, simply presume they have a right to withhold information and deceive the public. It is a presumption which so far remains largely unchallenged by news media. 1. Sig Mickelson, America's Other Voice (New York: Praeger, 1983), 4-10. 2. Donald Shanor, The New Voice of Radio Free Europe (An unpublished journalism research memorandum, New York: Columbia University, 1968), 207. 8. For informaton and details on the Crusade for Freedom see the Crusade for Freedom Newsletters in the Charles Taft paper collection, Library of Congress, Washington, D.C. Boxes 153, 156, hereafter Taft collection; and Mickelson s discussion of the Crusade in America's Other Voice, 51-58. 9. Mickelson, America's Other Voice, 55. 10. See Crusade for Freedom Newsletter July 1955 Taft collection, Box 156, folder Foreign Affairs: Geographic file, Europe: National Committee for Free Europe, Inc. I1. Ibid. 12. Ibid. 13. Eighteen papers that published articles about Eisenhower's support for the Crusade or articles and advertisements supportive of the Crusade between February 7-10, 1955, include the Atlanta Journal-Constitution, Boston Globe, Chicago Tribune, Jackson, Miss., Clarion-Ledger, Des Moines Register, Houston Post, Indianapolis Star Los Angeles Times, Louisville-Courier Journal Milwaukee Journal,Minneapolis Morning Tribune, New York Herald Tribune, New York Times, Charleston News and Courier, Portland Oregonian, San Francisco Chronicle, San Francisco Examiner, and Washington Post Six papers that had no coverage of the Crusade on the specified days include the Christian Science Monitor, Charlotte Observer, New Orleans Times Picayune, Wall Street Journal, and Pitsburgh Courier. Regarding Eisenhower's support for the Crusade he was one of its founders, as well as a member of the National Committee for a Free Europe. He held occasional fund raisers for the Crusade at the White House, which were attended by businessmen, but few people in media. 14. See, for example, "How They Hear the Truth behind the Iron Curtain," Boston Globe, 8 Feb. 1955, 3, or the same advertisement in the San Francisco Chronicle, 8 Feb. 1955, 2. 15. After IS years, the Crusade brought in close to $50 million. The cost of implementing and sustaining the Crusade's campaign was $20 million, leaving only $30 million leavin only $30 million of total support for the Radios. This was just a fraction of what they needed to operate. See Mickelson, America 's Other Voice, 58. 16. New York Times "President Appeals For Satellite People," 8 Feb. 1955, 1 and 6. Besides Eisenhower, the article quotes General Walter Bedell Smith, the former Under Secretary of State, and Henry Ford II. Their comments were made for a fund-raiser, which was broadcast over closed-circuit television from ABC's studios in New York to audiences in thirty-three cities. 17. San Francisco Examiner, "California's 800 Legion Posts to Back Fund Drive for Radio Free Europe," 7 Feb. 1955, p. 28. 18. Clarion-Ledger, "Governor Proclaims Freedom Week Here," 8 Feb. 1955,13. 19. Crusade for Freedom Newsletter, July 1955,Taft collection, Box 156 folder Foreign Affairs: Geographic file Europe: National Committee for Free Europe, Inc. Broadcast media supported the Crusade as well. The Newsletter boasted that in 1955 "substantially more than 500 Crusade messages were [broadcast] by CBS, NBC, ABC, MBS and Dumont networks." While the Crusade's numbers might not be correct, it seems certain that the campaign did receive support from radio and television broadcasters. Well-known figures in broadcasting, such as Ed Sullivan and Edward R. Murrow, were used in commercials promoting the Crusade's efforts. The Newsletter also reported that "twenty-six national consumer magazines with circulations in excess of 46 million readers carried Crusade articles, editorials or special mentions; as did 52 national organization magazines with 14 million readers, and trade magazines reaching an additional two million." Propaganda Network Built by the CIA," 26 Dec. 1977, 1- "CIA Established Many Links to Journalists in U.S. and Abroad," 27 Dec. 1977, 1; "Varying Ties to the CIA Confirmed in Inquiry," 27 Dec. 1977, 41; "A Young Reporter's Decision to Join CIA Led to Strain Anger and Regret" 27 Dec. 1977,41. Also see "CIA and the Press," Editor & Publisher, 17 Sept.1977, 6; "Shaping Tomorrow's CIA," Time, 6 Feb. 1978, 15; Stuart Loory, "The CIA's Use of the Press: A Mighty Wurlitzer," Columbia Journalism Review, Sept./Oct. 1974, 819; "The CIA Connection,"Newsweek 10 Dec. 1973, 18; "CBS-CIA Connection Confirmed by Salant," Broadcasting, 30 May 1977, 22. For government investigations see Final Report of the Select Committee to Study Governmental Operations with Respect to Intelligence Activities, United States Senate, 94 Cong., 2 session S. Doc. 94-755, 1976, 3 vols. (informally known as the Church Committee). Also see House Select Committee on Intelligence Report (Pike Committee Report),19 Jan. 1976. This report was unpublished but was leaked to the press and is cited in Bernardo Carvalho, "The CIA and the Press," Freedom of Information Center Report 382, December 1977. For government investigations specifically into RFE and RL, see Hearing before the Committee on Foreign Relations, United States Senate, 92 Cong., S. 18 and S. 1936, "Public Financing of Radio Free Europe and Radio Liberty," 24 May 1971; Hearings before the Committee on Foreign Relations, United States Senate, 92 Cong., S3645, "Funding of Radio Free Europe and Radio Liberty," 6 and 7 June 1972. White, publisher of the family-owned Emporia, Kan., Gazette from 1944 to 1973. He was elected treasurer of RL and remained a trustee until his death in 1973. Edwin Palmer Hoyt, publisher of the Portland Oregonian, and William Wesley Waymack a Pulitzer Prize-winning editorial writer who became editor of the Des Moines Register and Tribune, lent their names and sometimes their resources to RFE. A few others who figured prominently as board members and founding members of the stations include DeWitt Wallace, the publisher of Reader's Digest, Mark Ethridge, publisher of the Louisville Courier Journal; Hamilton Fish Armstrong, editor of Foreign Affairs, and Frank Stanton of CBS News. 22. Henry R. Luce "Fund Raising Takes To Air,"Life 22 Feb. 1954, 37. Also See Crusade for Freedom Newsletter, February 1954, Taft collection, Boxes 153-156. 23. Alan Grover, president of Time, for example, was an original organizer of Radio Liberty. Roy Larsen, a vice president of Time, Inc., was a member of the board of directors for the Radio Free Europe Fund. For complete lists of RFE and RL board members, see the Board for International Broadcasting annual reports. 28. "The President's Committee on International Information Activities: Report to the President," 30 June 1953. U.S. President's Committee on International Information Activities: the Jackson Committee, Box 14, 39-40, 4143, Dwight D. Eisenhower Library, Abilene, Kan.
Development of Overt and Covert Propaganda Strategies," Presidential Studies Quarterly 24 (Spring 1994): 267. 32. Mickelson,America's Other Voice, 121. 33. Gene Mater, telephone interview with author, 20 July 1996. Mater worked for the San Bernadino Sun Telegram, Newark StarLedger and New York World Telegram before becoming RFE's head of news and information from 1959 to 1965. Ironically, he was thought of as a "news purist." 34. Leland Stowe for example, was a Pulitzer Prize winning journalist who became head of RFE's News and Information department before Mater. He was responsible for hiring other excellent reporters for the Radios, such as Russell Hill, of the New York Herald Tribune; Allan Dreyfuss of ABC and Reuters in Europe Frederick B. Opper, of ABC; Talbot Hood, of the United Press in London; and John Elliott, of the New York Herald Tribune. For information specifically on Stowe's activities at RFE, see America's Other Voice 96, and the Leland Stowe papers, 1925-1969, State Historical Society of Wisconsin, Box 10, Folders 5 and 6. 35. Shanor, The New Voice of Radio Free Europe, 210. 36. Ibid. 37. Mickelson, America's Other Voice, 125. 38. For letters from Anne McCormick to John Foster Dulles and others connected to RFE and RL, see the Anne O'Hare McCormick papers, 1931-1954, New York Public Library, Rare Books and Manuscripts Division, Boxes 6,7,10. Descriptions of McCormick's associations with Chamberlin can be found in Chamberlin's diaries; for example, see 6 Nov. 1940, 2 Oct 1941, and 6 April 1946., 19491956. 39. See Leland Stowe to Whitney Shepardson, "RFE's News and Information Service: Facts About Its Specialized Coverage and Products in Relation to Their Costs," 29 Dec. 1953, Leland Stowe papers, State Historical Society of Wisconsin, Box 10, folder 5. 40. A complete list of reporters who corresponded with RFE executives would be very long but would include Walter Graebner, Joseph Alsop, Daniel Longwell, Robert Lee Sherrod, Claude Gemade Bowers, Arthur Sweetser, Nicolas Roosevelt, Brant Irving, and Harry Barnard. 41. Rion Bercovici to Joseph Alsop, 28 Nov. 1952, Joseph and Stewart Alsop papers, Library of Congress, Box 8. Also see Joseph Alsop to Bercovici,10 Dec. 1952, Box 8. 42. Mickelson,America's Other Voice, 125. 43. Sol Stem, telephone interview with author, 20 July 1996. 44. Ibid. 45. Sol Stern, "NSA and the CIA,"Ramparts, 5 March 1967. The article exposing the link between the NSA and the CIA did not appear until March 1967. The New York Times was able to break the story first on February 14, before Ramparts, most probably because Ramparts editors advertised their new issue in a full-page Times ad. Additionally, Ramp arts editors mailed out advanced copies of their publication which Times editors very likely received. 46. "In the Pay of the CIA, An American Dilemma" CBS News, 13 March 1967, CBS Archives, New York City. 47. Mickelson, America's Other Voice, 124. 48. Ron Bonn, telephone interview with author,16 April 1996. 49. Victor Marchetti and John Marks, The CIA and the Cult of Intelligence (New York: Alfred A. Knopf, 1974), 208. 50. See A. Panfilov, Broadcasting Pirates: Or Abuse of the Microphone (Moscow: Progress Publishers, 1981). 51. Ibid. 52. Mickelson, America's Other Voice, 222. 53. See Edward S. Herman and Noam Chomsky, Manufacturing Consent: The Political Economy of the Mass Media (New York: Pantheon Books, 1988), xi. 54. See Noam Chomsky, Necessary Illusions: Thought Control in Democratic Societies (Boston, Mass. : South End Press, 1989), 19. Chomsky explains why illusions are necessary in a democracy: "In the democratic system, the necessary illusions cannot be imposed by force. Rather, they must be instilled in the public mind by more subtle means. A totalitarian state can be satisfied with lesser degrees of allegiance to required truths. It is sufficient that people obey, what they think is secondary concern. But in a democratic political order, there is always the danger that independent thought might be translated into political action, so it is important to eliminate the threat at its root. Debate cannot be stilled, and indeed, in a properly functioning system of propaganda, it should not be, because it has a system-reinforcing character if constrained within proper boundaries. What is essential is to set the bounds firmly. Controversy may rage as long as it adheres to the presuppositions that define the consensus of elites, and it should furthermore be encouraged within these bounds, thus helping to establish these doctrines as the very condition of thinkable thought while reinforcing the belief that freedom reigns" (48). 58. Associated Press. Online wire report. CompuServe Information Services. 18 April, 1996. Jounalists"Editor & Publisher, 2 Mar. 6. 60. "Journalists As Spies," "Reliable Sources" transcript, Cable News Network, 25 Feb. 1996, Internet (/ TRANSCRIPTS/rs.html) 25 March 1996. During an el discussion about this issue, Richard Haass, the director of National Security Programs for the Council on Foreign Relations, opposed establishing rules regulating govemment/media relationships. 61. Ibid. Kurtz was also a panelist. 62. "60 Minutes," 13 Oct. 1996, CBS Archives. Stacey Cone is a first-year doctoral student in journalism and mass communications at the University of North Carolina at Chapel Hill.